Ages ago, I came across, and bought, an unopened box of Jean Patou Ma Collection: Parfums d'Epoque 1925-1964. The glossy black box contained small bottles of 12 Patou perfumes: Amour Amour, Que Sais-Je?, Adieu Sagesse, Chaldée, Moment Suprême, Cocktail, Divine Folie, Normandie, Vacances, Colony, L'Heure Attendue and Câline. Of all the perfumes in Ma Collection, two stayed in my mind over the years — Chaldée and Colony (maybe the first time I smelled pineapple in a fragrance). Today, I'm reviewing Chaldée in two forms: as it was re-released in 1984, and in today's Collection Héritage range. (perfumer Henri Alméras, 1984 Ma Collection reissue); orange blossom, hyacinth, lilac, jasmine, narcissus, opoponax, amber and vanilla. 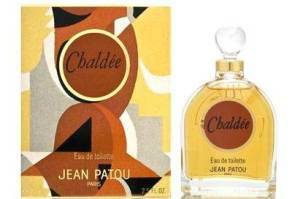 Chaldée started life as a best-selling suntan oil before being "converted" into parfum form in 1927 by Henri Alméras. As always, I wish I could have smelled original 1927 Chaldée; that's impossible, so the next best thing is 1984's re-issue. Recently, I bought an unused/unopened 100 ml bottle of the 1984 formula and I'm using that for this review. On first breath, Chaldée smells like I've entered a florist's shop full of newly arrived blossoms. Spring is represented by lush hyacinth, narcissus and lilac (beautifully blended, but each flower is able to present its own scent apart from "the bouquet"). Summery, dense jasmine and liquor-y orange blossom (no soapy orange blossom here) lead to a toothy (but non-animalic) leather-tinged musk that blends seamlessly into floral-vanillic amber and opoponax (this phase of Chaldée smells beach-y...and better than any 'beach perfume' I've smelled, PERIOD). In the extreme dry down, Chaldée's flowers play a cute trick...they all seem to "dress up" in plumeria garb to provide a tropical-flower finish. Chaldée rescues me from the doldrums and gets me dreaming about the coast: warm weather, the ocean, sunbathing in the tropics. Chaldée is one of my favorite perfumes. Since the 1984 version of Chaldée is becoming hard to find and prohibitively expensive, I was anxious to see if new Collection Héritage Chaldée would save me from a Chaldée-less future. With IFRA rules aplenty, perfumer Fontaine no doubt had many restrictions to his perfumer's palette for 2013 Chaldée. From first spritz, I smelt there was trouble. The opening of new Chaldée smells "mostly" like 1984 Chaldée, but diluted (1984 Chaldée smells more like an Eau de Parfum than the 2013 version). The same flowers seem to be in attendance in the new formula, but in lesser amounts. At $245 for 100 ml, I'd assume the budget allowed for quality and quantity of "old" Chaldée's ingredients. Some of the lighter quality/sheer character of new Chaldée may be due to the fact it IS new...it's not had time to develop in the bottle as has my 1984 Chaldée. The saddest part of Collection Héritage Chaldée? The base. Though its heart notes are OK and true to smell, and conjure the spirit of 1984 Chaldée, gone is my beloved tropical beach/suntan oil experience that's so sensational in 1984 Chaldée. Perhaps those dense musk and floral amber notes are forbidden by IFRA now...or no longer available? Or was that particular accord deemed "unstylish" for today's consumer? We'll never know. If I ever see another bottle of 1984 Chaldée for sale, I'm buying it. I used every drop of the 12 perfumes in that glossy black Patou Ma Collection box (and still use the box to store my tubes of watercolor paints). When I wore those Ma Collection perfumes, my "nose" was not what it is today; and I'd give A LOT to be able to have that fresh box of perfumes sitting in front of me now. Things rarely happen at the best possible moment. Note: Top image is Sunbaker [altered], 1937, by Max Dupain, via Wikimedia Commons. Read Angela's take on Patou's Ma Collection here and here. Also a proud owner of a Ma Collection box. Found it in a perfume store in the Southcenter mall! Are they going to be releasing Que Sais-Je? Where are they selling the new releases? Eliza…Select Neiman Marcus stores carry the Collection Heritage in the US…as does Bergdorf Goodman. And, yes, Que Sais-Je will be/is reissued. Damn. I held out (very) reduced hope that these would be faithful. monkeytoe: well, Collection Héritage Patou Pour Homme was successful I think. Hope they’ll offer a “discovery” set of the reissues sometime…the 100 ml bottles — way too much juice for me. I also pounced on one of those Ma Collection sets early in my perfume exploration, and then bought some FBs. Chaldée is one of my favs, too, along with Que sais-je? The one I’m really hoping they do, and do right, is Vacances. Seems like it might be easier to do within current constraint than Chaldée – I hope! The artwork on the old boxes was great – those colors! Noz’ yes, and those old bottles are so nice too. I spritzed on vintage Chaldée to celebrate your review, and am struck by what a wonderfully happy perfume this is – so relaxing! Ah, Kevin, the story of our time – I am like a cranky old bat with my constant whingeing about how all my favourites are being diluted. I am thinking it is almost better not to have the new formulations at all if they are going to disappoint. I used to wear all those Patou gems, and Que Sais-Je? was my favourite (possibly because of the name!). Que Sais-Je? smells great, too! If I were going to change my screen name, Cranky Old Bat would be high on the list of options. Well, I was going to say you can’t have that name it’s mine! But then I thought I could call myself Cranky Old Cat – but I suspect we might fight over that too! It’s in the nature of being cranky ….. and it would be a cat fight …..
Jillie: most people won’t know what they’re missing! This is one of those times I’m glad I never smelled the original. I bought the new version, and only being able to judge it for what it is, one me it’s a warm powdery (not face powder powdery, amber/opoponax powdery, which comes across as hot skin) sunny floral (lilac and orange blossom on me mainly). It doesn’t smell remotely beachy in the modern perfumery sense (coconut/big white floral) but I can absolutely believe in a vintage format (so meaning bigger and stronger, although it doesn’t wear ‘weak’ on me by any means) that it was used as a tanning oil scent. I can picture it being used by the characters in Tender Is The Night when they are sunning themselves on the Riviera. It’s a fabulous grown-up alternative to the usual beachy scents – especially if you are shy of big tuberose/gardenia/jasmines. 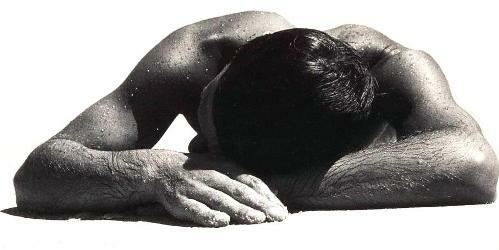 This is the scent of the models in swimsuits in Hoyningen-Huene black and white photos.